University Circle is Cleveland's cultural center. Located at the intersection of Martin Luther King Jr. Drive, Carnegie Boulevard, and Euclid Avenue, this area is home to museums, such as the venerable Cleveland Museum of Art and the Western Reserve Historical Society, colleges and universities, including Case Western Reserve University and the Cleveland Institute of Music, and landscaped green spaces, such as Wade Oval and Rockefeller Park. The area is centered around Wade Oval, a tract of land donated to the city by turn-of-the-century business tycoon Jeptha Wade. It is also home to the Cleveland Botanical Garden and some interesting and diverse restaurants, coffee shops, and nightspots. During the summer months, the area comes alive each Wednesday evening for "Wade Oval Wednesdays," an evening of discounted admissions, free concerts, and lots of fun. A free shuttle circles the area every fifteen minutes and makes stops at all of the area attractions. Walking, though, is the best way to see this fascinating area. 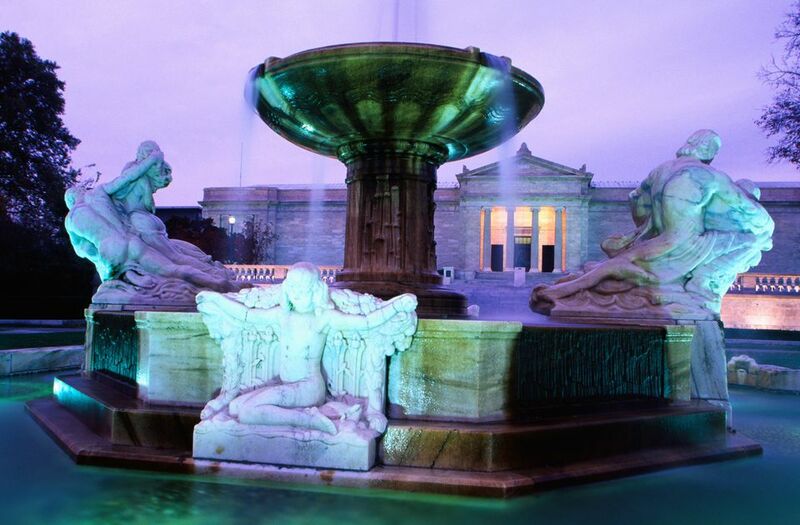 Right at the intersection of Martin Luther King Dr. and Euclid Ave., set back behind a beautiful reflecting pond, is the Cleveland Museum of Art. This cultural jewel is a must-see for any resident or visitor to the city. If you are driving, there are many metered parking spaces around Martin Luther King Drive as well as along Wade Oval. You can also park in the museum's three-story covered lot, adjacent to the museum. The Cleveland Museum of Art's permanent collection is free to the public. The diverse collection includes a large selection of popular Impressionist works, with paintings by Monet, Degas, and Renoir as well as sculpture by Rodin and Degas, among others. The museum is also known for its extensive Asian art exhibits, its colorful armor court, and its collection of Medieval religious artifacts. The museum has a cafe offering surprisingly delicious food as well as wine and beer. Leaving the Cleveland Museum of Art from the front of the main entrance, turn left and continue around Wade Oval to the Cleveland Museum of Natural History. Alternately, you can wait at the entrance for the University Circle shuttle which comes by every 15 minutes. The Cleveland Museum of Natural History is a treasure trove of everything to do with Northeast Ohio's plants, animals, stars, and early inhabitants. There are dinosaur bones, Native American archeological finds, fossils, and information on the area's flora and fauna. The museum's Planetarium hosts several fascinating shows daily, featuring the stars in the current Cleveland sky as well as a talk on an astrological topic. It's fun for the whole family. The museum has a cafe, The Blue Planet, which serves light snacks and beverages. Continuing around the circle, you'll soon come to the Western Reserve Historical Society, a fascinating museum about all facets of Cleveland's history. Also housed within the complex is the Crawford Auto and Aviation Museum, a unique collection of scores of antique and historical cars and planes, with particular emphasis on the contribution of Cleveland automakers. The museum complex is centered around two 19th century townhouses, moved from their original locations to University Circle. Much of the original decor and furnishings have been preserved and they offer visitors a glimpse of life during Cleveland's Gilded Age. Another interesting section of the museum is the Chisholm Halle Costume Wing, which features a rotating display of the museum's vast holdings of period clothes and accessories. Other exhibits include information on early Cleveland and the Connecticut Western Reserve, a recreated typical log cabin home, and exhibits about Cleveland during its heyday at the end of the 19th and early 20th century. The Western Reserve Historical Society has an extensive research library and visitors are welcome to use its materials. Continuing around Wade Oval, you'll see the modern Cleveland Institute of Music building. Home to one of the country top conservatories, the Cleveland Institute of Music is dedicated to quality music education for people of all ages and all skill levels. To that end, they offer an excellent undergraduate and graduate-level degree program as well as children's programs and adult continuing and beginning music instruction. CIM offers more than 500 concerts each year, many of them free to the public. Frequently members of the Cleveland Orchestra, many of them CIM faculty members join the student musicians. Occasionally, superstars, such as YoYo Ma and Issac Stern, join the fun. If can incorporate a concert into your visit, by all means, do so. Continuing around Wade Oval from the Cleveland Institute of Music, you'll come to the glass-domed Cleveland Botanical Garden. Founded in 1930, primarily as a gardening library and research center, the Garden today includes a magical glasshouse which houses the "Spiny Desert of Madagascar" and the "Cloud Forest of Costa Rica" exhibits as well as the now extensive library, a unique and fascinating gift shop, and various temporary exhibits. The Garden is a favorite stop during the December holiday season when the various area garden clubs each decorate a holiday tree to display. The outdoor display gardens include a peaceful Japanese tea garden, a whimsical children's garden, a formal rose garden, a woodland garden and a children's garden. At the end of the Oval, at the corner of Euclid Avenue, sits the venerable Severance Hall, home of the world-famous hometown Cleveland Orchestra. The building, perched on a narrow triangle of land, leased from Case Western Reserve University, has a majestic neo-classical facade and a somewhat whimsical Art Deco interior. Finished in 1931, the concert hall is named after the donor's, John L. Severance, wife Elisabeth who died suddenly before the building was completed. The interior is highlighted with lotus flower motifs throughout, a tribute to Mrs. Severance and her favorite flower. The Cleveland Orchestra plays at Severance Hall most Thursday, Friday, and Saturday nights throughout the winter season. From Severance Hall, turn back along Wade Oval, past the Cleveland Institute of Music, and veer to the right. There at the corner of Ford Dr and Wade Oval sits the gracious Glidden House, built in 1901 by the Glidden family (of painting products fame). The mansion, which sits right between the museums and Case Western Reserve University, has been a bed and breakfast inn for about a decade and is still one of the most gracious, romantic, and unique accommodations in Cleveland. Rooms at the Glidden House have a combination of old-world style and modern amenities. All rooms feature high-speed Internet access and 42" plasma screen TVs as well as mahogany and cherry four-poster beds, fireplaces, and majestic high ceilings. The Inn is a popular venue for weddings and other social events.